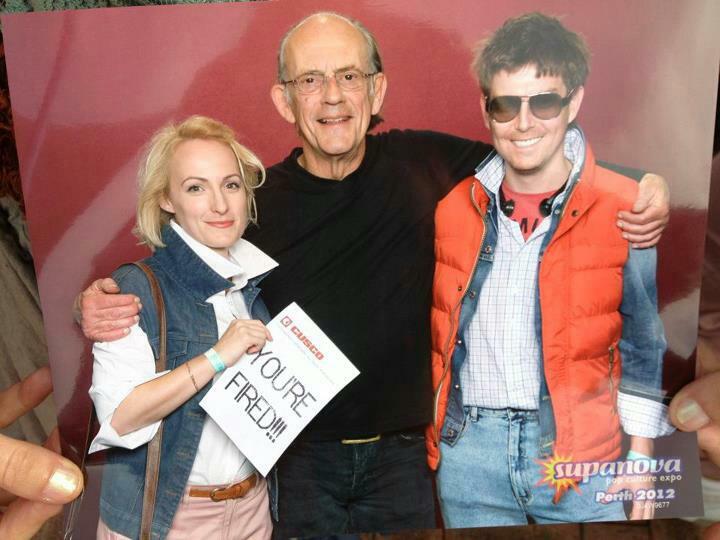 Two of my very good friends in Australia went along to the Supanova Pop Culture Expo in Perth yesterday and got the opportunity to meet the absolute legend that is Christopher Lloyd. Yes that's right Doc Brown from the Back to the Future series. In the flesh. And here's the photo to prove it! Not only that but they did it in grand style. That's T.A. on the left dressed as Claudia Wells/Elisabeth Shue (I'm guessing she's going for Shue as the 'You're Fired' note is from Part 2) as Jennifer Parker/McFly. On the right is JJ dressed as Michael J. Fox as Marty McFly. And in the middle is the Doc, unfortunately not dressed as the Doc. Shame he didn't make an effort. Only kidding, what a legend! Seriously... how freaking awesome is this? Anyone else met someone as cool as Mr Lloyd and got the photo to prove it? Events like these are great. Just look at the smile on that old man in the middle's face getting to meet not one but two celebrities at once! I would have been super-excited to met Chris Lloyd. I have to say you friends clothes are exactly the same as the movie! haha yeah but the grin on JJ's face is even more priceless! Yeah they did an amazing job with the clothes! No way! You met Sarah Connor??? That's freaking awesome! Cary Elwes, the man in tights! That's awesome too! Nice photo, can't believe you got him to pick you up! Linda Hamilton was very pleasant, but she was so incredibly busy, she barely had a chance to look up and say hello. But with that being said, still very nice! Cary Elwes... *sigh* Ohh Westley! Aaah awesome! Would love Linda Hamilton to pick me up and throw me over her shoulder for a photo!